Not since the protest on February 15, 2003, when close to 7000 Victorians joined with millions worldwide to dare the US to attack Iraq, have I felt such collective humanity. But unlike our resistance to war, this time we were focusing on the rotten heart of our corrupt political and financial systems-GREED. And although we have gathered, walked, sat down and stopped traffic, sang, made music, wore costumes and carried insightful and profound messages, many times in the past, the thrill of Occupy Together was the feeling that this is just the beginning of a huge culture shift. Here we are at the corner of Douglas and Fort where we occupied the intersection, facing the Royal Bank on one corner and Coast Capital on the other. Almost 1000 walked to the legislature and back to Centennial Square where a People’s Assembly was held. The occupation continues at Centennial Square. Join in the meetings on Tuesday and Thursdays at 7 pm and Sundays at 2 pm. Every day there is a lounge from noon to 2 pm, so if you work downtown, just drop by. Food and other provisions gratefully accepted. Owners of Zuccotti Park, the current home of Occupy Wall St, have delayed the temporary eviction of the protesters in order to power-wash the park. Due to the numbers present and the number of supporters, some politicians urged the company evict the protesters. For the time being. Listen to the clip below. Thanks to Jan Slakov for forwarding this. 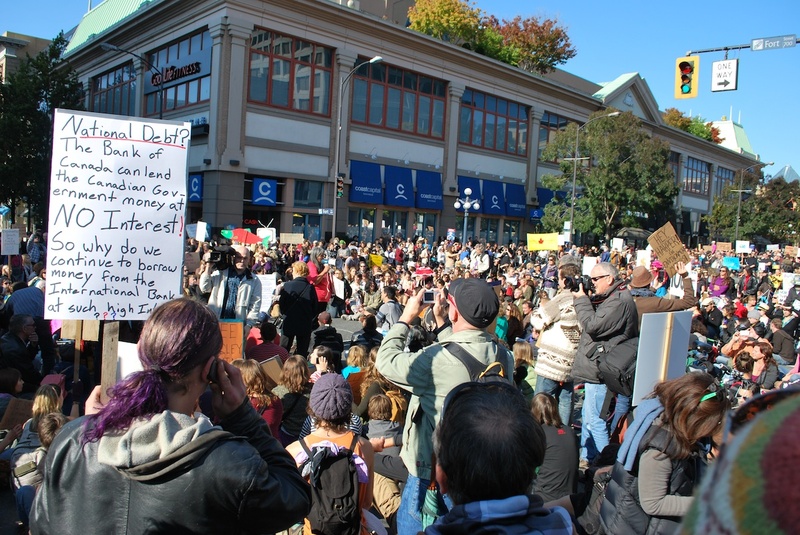 Occupy Wall St has become a solidarity movement around the world. Across Canada on October 15, there will be groups of people occupying public space and echoing the dissatisfaction of the 99% with 1% rule for the 1%. Join the 99% calling for change. We don’t know what this change looks like yet, but it’s in our hearts and determination. 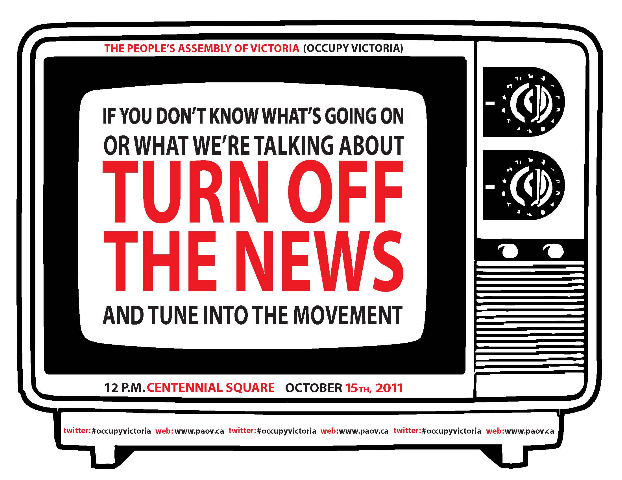 Join the People’s Assembly of Victoria. Find out about it. Bring signs. For ideas, google Occupy Wall St.